Sheila will graduate Uhuru Academy in 2017 and comes from Vumilia Resettlement Village. She lives with her grandmother and has two sisters named Rosemary and Sylivia. Sheila is still deciding what career she will pursue. She has many interests, including becoming a neurosurgeon, air hostess, or ship captain. A unique feature about Sheila is her dimples. Another is her talent for writing Christian rap that inspires others to be peaceful and to have hope. 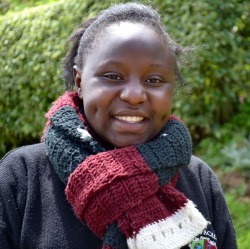 She loves the way the teachers teach at Uhuru – they are approachable and friendly. She says that education is important because it helps her to have a good future. The future would be miserable without an education.